The sensor people are presenting forward-looking sensor solutions for compartment fine positioning at the 28th German Material Flow Conference in Garching from March 21–23, 2019. Owen, February 1, 2019 – At the 28th German Material Flow Conference (Deutscher Materialfluss-Kongress) in the Department of Mechanical Engineering of the Technical University of Munich in Garching, Leuze electronic will be showing how intelligent compartment fine positioning with reduced downtimes can succeed. 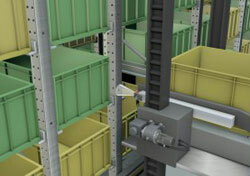 "With the IPS 200i, Leuze electronic offers the world’s smallest camera-based IP65-sensor for the compartment fine positioning of high-bay storage devices. The new sensor, which is optimized for depth of field, features a fixed focus position and, after rough positioning, is used for optical fine positioning of a high-bay storage device in the X or Y direction. It is capable of transmitting the correction coordinates for the precise positioning of a rack to a high-bay storage device," explains Matthias Göhner, Industry Manager Intralogistics at Leuze electronic. Through its web-based, multi-language configuration tool with user-guided wizard, the positioning sensor can be commissioned and operated easily and quickly. Four feedback LEDs assist during sensor alignment. These flash with a frequency that is proportional to the distance to the target position. If the sensor is perfectly aligned, all four LEDs illuminate simultaneously. With the first-ever introduction of a quality score, the IPS 200i notifies of changes to the sensor or rack and thus assists the user in identifying possible faults early, so that predictive maintenance – one of the most frequently mentioned application areas of Industry 4.0 – can be performed. The quality score also facilitates the identification of particularities that may precede a system failure. For such areas, the IPS 200i can also optionally be used for image transfer. With the integrated Ethernet interface (TCP/IP or UDP) and the planned PROFINET interface, both direct integration into the customer's network environment and quick, location-independent diagnostics via remote control are possible.